For the past month, due to the demands of work, I’ve mostly had my head full of outmoded, alternative theories of evolution, and my fingers aching from trying to offer useful interpretations of the response these ideas received. An unshakable head cold made these ideas immovable, even long after I had finished work, such that in the evenings I’d find myself pondering whether a recipe for lasagne had any evolutionary connotations (the pasta transformed, changed its state as cooking progressed). I felt it best to avoid putting anything on Painted Wooden Cubes during this time. Nobody needs an occultist evolutionary interpretation of Zooloretto. I have, however, managed to fit in a few games, a number new to me. Two were newer games (from 2012), and I’ll focus on those here. I’ve played Tom Lehmann and Joe Huber’s Starship Merchants three and half times since the beginning of April, and enjoyed it a great deal. In itself, Starship Merchants offers a trim, brisk economic game of a kind that rather appeals to me. Its board constitutes a rondel of four spaces, each representing a stage in the business cycle of the asteroid mining company players are tasked with running. Each turn a player may either take an action in the space he or she occupies, or move to the next space, taking an action there if possible and if desired. The stay-or-go dilemmas the game presents are very readable (there’s no struggle to assess one’s legal options), but are frequently challenging, and significant nevertheless: in that Starship Merchants borrows the system of vehicle obsolescence from 18xx, timing is key. Staying, say, in the shipyard to buy an extra ship might be worthwhile, even if a loan is needed to do so, in that it can force the pace at which other players can complete the business cycle: the cost of loans becomes rather easier to stomach if it’s possible to send other players’ older ships into obsolescence. However, a particular attraction of Starship Merchants, for me, has been its suitability for the game club environment in which a lot of my play takes place. Enough is readable for new players to enjoy their first game (important when most games will feature at least one new player), and, I think, enough is in the game is enjoyable to those who want a build-up-my-own-little-kingdom quality in their games. 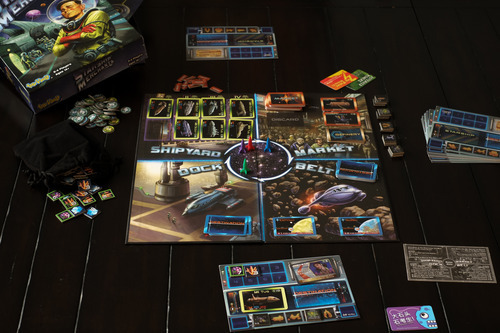 Starship Merchants neither confronts its players with auctions, nor with the need to set a value for a company being floated. It also allows players to customize their spaceships with upgrades, meaning the game can be played with a paths-to-victory mentality (though I’d like to believe bitter economic sabotage can win out over this – I have, however, come second in all three of my completed games). I reckon this one will stay in pretty heavy rotation for some time to come. We’ll see. Also new to me this month was Sebastian Bleasdale and Richard Breese’s Keyflower, which I’ve now played twice. An admittedly sweet-looking worker placement game about building a New World settlement, it’s a lot of things Starship Merchants isn’t. Where Starship Merchants offers readable but challenging decisions, Keyflower offers a challenge largely because it’s hard to read. There’s so much going on that, before you start to choose an action, it’s fatiguing just to work out what you should be choosing between. By the last round of the game (when playing with four), there will be (if my memory doesn’t fail me), 28 possible action spaces to use, in addition, potentially, to 15 simultaneous auctions to participate in. 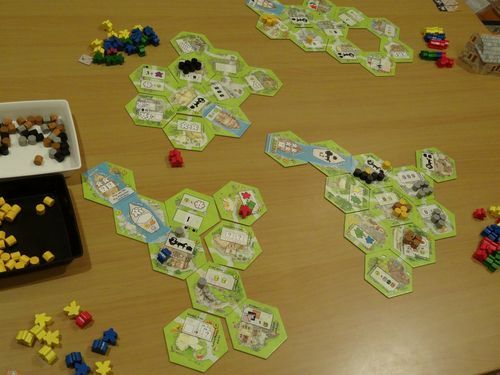 What is more, most of those action spaces will be in front of other players, perhaps oriented away from you, their powers possibly obscured by meeples which have already used them (but not blocked them – tiles can be used and re-used in a single round). What is still more is that each of those action spaces may be or may not be in an upgraded state. It’s a lot to keep track of before even thinking about strategy and good play. Though, as a paths-to-victory game, certain action tiles will likely become less and less appealing as the game progresses (you might focus on collecting tools or resources, or accumulating extra meeples), and though there’s a price for using tiles owned by an opponent (meaning some legal choices may not, in fact, be worth considering), I’d be inclined to suspect that successful play in Keyflower, as in other worker placement games, will include a certain level of unexpected, opportunistic use of usually sub-optimal actions – grabbing a tile at auction to deny points to a successful opponent, say, or picking up a resource which has not featured in your plans for a possibly decisive point or two. Thus, following the evolution (there’s that word) of the array of action spaces does appear key in Keyflower. It’s a challenge which promises a headache, but doesn’t, to me, promise a great deal of intellectual stimulation. I also played a couple of older games that were new to me. I played Michael Kiesling and Wolfgang Kramer’s Maharaja once, and hope to play again, as well as Bernd Brunhofer’s Saint Petersburg, which I’d rather avoid playing ever again. Between the two experiences, I find a reminder that the wish for a return to design principles of an earlier time is in part informed by the optimism of nostalgia. Maharaja is clean sort of area control game which can be played and explained quickly, but has one especially neat element which twists things – players can steal one another’s position in turn order – a fact which results in some pleasingly tough choices. Saint Petersburg, however, shows that clean can also imply sterile. It’s an early tableau-building game, and I very much missed the wild powers found in more contemporary games in that genre such as Innovation and Glory to Rome. In Saint Petersburg, the vast majority of cards offer either money or victory points (or both) and nothing more. The question ‘Is this it?’ ran through my head roughly every 30 seconds for the duration of the game. But that indeed was it. Sometimes the evolution of game design really is progress. *Perfect* description of St Petersburg. I disagree! I’ve played Starship Merchants and Keyflower each three times and am more eager to play Keyflower again. I must say though that I own the latter game and this is likely a major influence. However I have found that Keyflower got a very warm response indeed when I introduced it to people. I find myself itching to get back to it for another go to see if I can do better, like getting back on after being thrown from a bronco. After my first game I had a 3 clear strategy ideas that I didn’t see the first time. I think SM also has strategy to draw me back but after 3 plays it’s all still a bit mysterious to me still. Really the game played me and I’m none the wiser as to what to do next time. But that’s not fair, there is strategy to be explored – however I find it harder to find in SM than in Keyflower. Also you’re wrong, St Petersberg is a terrific game!